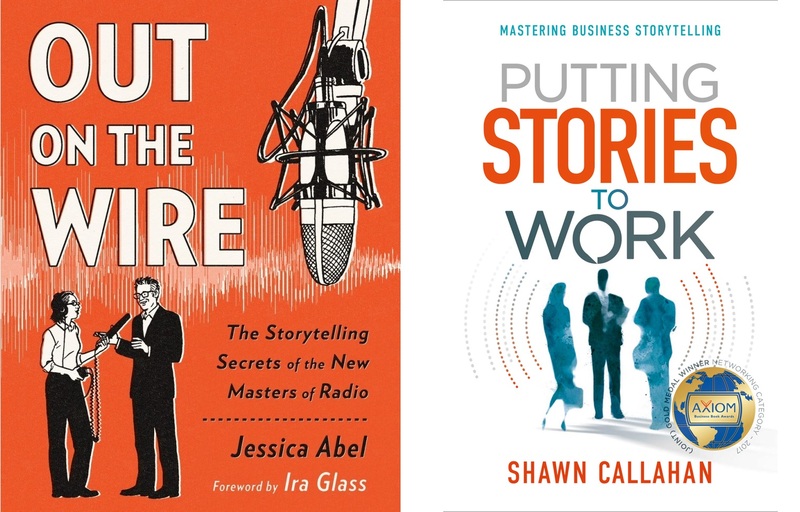 Two books I’ve read recently make good points about stories that apply to data stories, without the books being about data: Shawn Callahan’s Putting Stories to Work and Jessica Abel’s Out On the Wire. In Putting Stories to Work, Shawn Callahan has a very pragmatic view of how stories can be used in business. In particular, he advocates the use of anecdotes and he insists that the stories you tell must be true and must be yours (and if not, you have to tell people so you don’t risk making a fool of yourself). Everyone is talking about stories these days: ‘What’s the story of our business?’ ‘What’s the story of our product?’ ‘What’s my personal story?’ I even saw an advertisement in a shirt shop on Fifth Avenue in New York announcing the story of the shirts. But if you listen carefully, you’ll discover that many people who purport to share a story are not actually sharing one at all. It’s as if they think that if they are talking, they are telling a story. The point of the book is to use stories to make a specific point: establish your credibility, get ahead of potential counterarguments, get people to listen rather than think of what to say next, etc. To do that, you have to mine for stories. That is easier than it seems, but it requires some process and practice. But it’s also useful, because it opens your eyes to the stories (and non-stories) around you. This is a business book, but like Made to Stick it’s equal parts fascinating and fun to read. Callahan’s company isn’t called Anecdote for nothing, the book is filled with tons of stories that illustrate his points, thus also illustrating his overall point that stories are useful. Jessica Abel’s Out on the Wire is a comic about how radio is made. If the idea of reading a serious comic puts you off, you haven’t read any good comics (serious or not). Abel’s book fits right in with great comics like Scott McCloud’s Understanding Comics, Nick Sousanis’ Unflattening, or Doxiadis et al.’s Logicomix. She tells many stories about radio, in particular the NPR programs This American Life and Snap Judgment. There are many interesting insights into how they find and shape stories, how stories change as they develop, and how the agonizing creative process is playing out even in these well-known radio programs that have been going on for many years. I’m doing a story about X (the topic). And what’s interesting about it is Y (the story). Somebody does something because (motivation), but (challenge to overcome). It’s interesting to think about how these things apply to what we like to call stories with data – and how most of them really don’t have these elements. Data stories for the most part just lay out information without a lot of structure – but more on that in another posting. There are some radio-specific parts in the book that weren’t as interesting to me (though they’re fun to observe the next time you listen to a good radio program or well-produced podcast). The majority of the book is applicable to any form of structured narrative, however. If you're interested in telling stories with data, these two books are going to give you a better understanding of how stories can work in specific contexts. Both are based on a wealth of expertise and experience, Callahan from the business side and Abel from the radio side. They're also very different, and very nicely complement each other.